It was a typical Sunday for Deane Webb: church service at Christ Community Wesleyan Church, then relaxation and family time. On that night, he was treating his family to dinner at Texas Roadhouse. 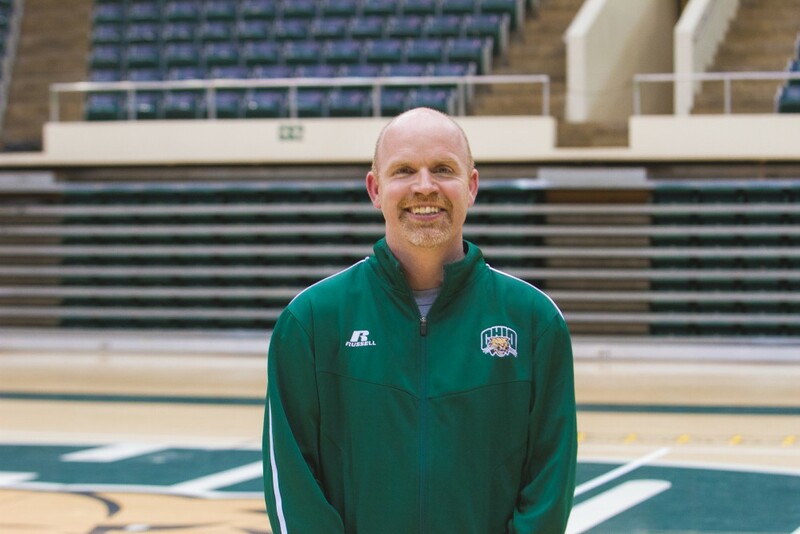 Deane Webb, the head coach of the Ohio volleyball team, comes from Belmont University, where he was the winningest coach in the program's history. With the meal finished, his family by his side and a toothpick in his mouth, it couldn’t get much better for Webb. He’s a good old boy from near Houston, Texas — and he loves his toothpicks. Webb’s daughters were driven crazy, embarrassed by their dad walking around with that toothpick hanging out of his mouth. The only way they might have been more embarrassed would have been if Webb was singing his favorite song, John Denver’s “Thank God I’m a Country Boy,” on the way back from the restaurant. Webb didn’t really care, though. He even joked with them about it. He’s got a personality that is genuine. He’s a Christian first, deeply rooted in his faith. He’s a father second, invested in his children. 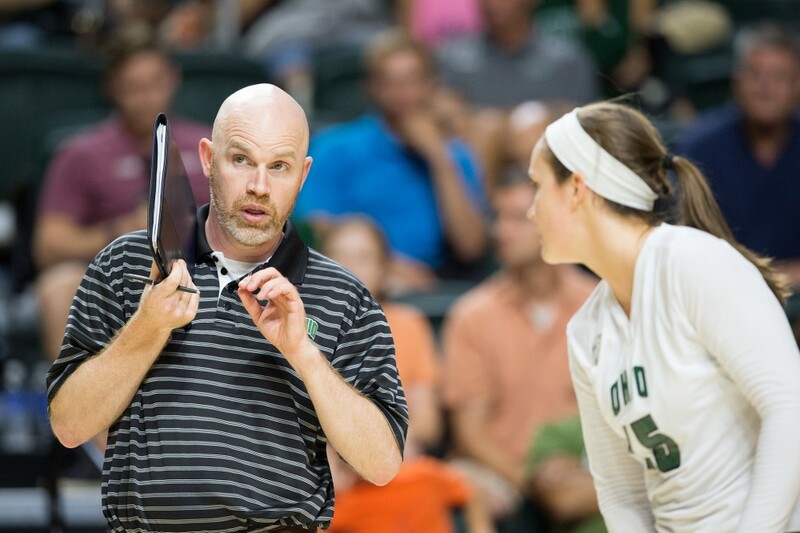 And he’s Ohio’s volleyball coach third, passionate about his profession. Before Athens, the Webb family lived in Nashville, Tennessee, for 11 years. Webb’s wife, Becky, is from Chattanooga, a two-hour drive southeast, so she was content with staying where they were. It was her home. When Deane was on the road and got word of the Ohio coaching job being open, Becky said no. She spent time in Ohio during her college years, and it was too flat for her liking. But she didn’t know Athens had higher terrain. “I said I had done my time in flat Ohio, and (Deane) replied back and said ‘No, there are hills. It looks like mountains in the picture,’ ” Becky said. He had turned down coaching offers before. Although there was discussion about the Ohio job, Deane had it good in Nashville. It wasn’t sacrifice that kept Deane from moving on to a new program: He was building a program at Belmont University. He remembered having seven volleyballs, one cart — with a missing wheel — and no volleyball lines on the court when he arrived there. But 11 years, three conference championships and three NCAA Tournament appearances later, Deane held the record for most wins in program history. He had turned Belmont into a winner. And he did all that without ever being an assistant coach, something he knows is unusual. It was challenging, but he built himself into a coach, learning the craft on the fly. “But he wanted more,” Becky said. 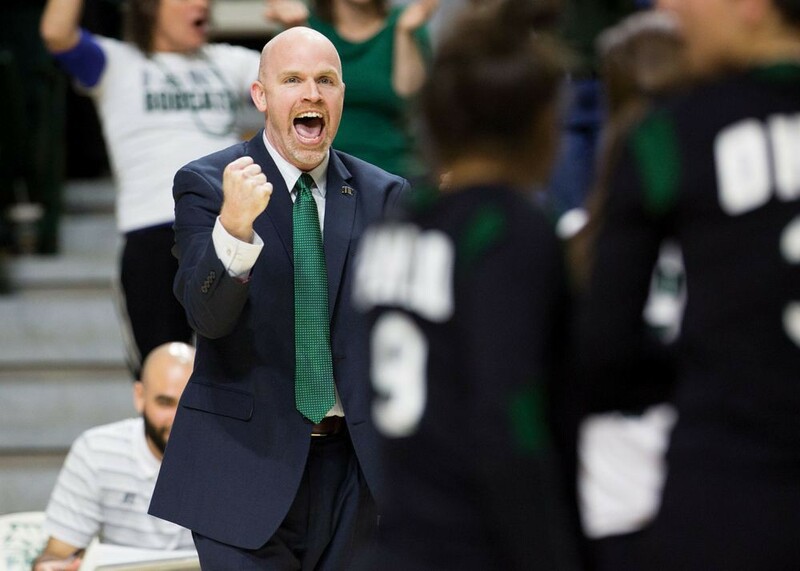 When he and Becky watched the NCAA Tournament in 2013, Deane called out plays on TV and knew what the top teams in college volleyball would run. It was that night Becky knew Deane needed a bigger challenge in his coaching career. They began to talk, they began to think and they began to pray. It wasn’t a decision that they could make based on coaching alone. Deane and Becky had a life in Nashville; they were raising a family there. Deane’s been challenging himself with competitions his entire life. It explains his participation on the typewriting team and the calculator team in grade school. It might also explain his love of computer games, or maybe even his absurd ping-pong skills. Sometimes, he plays left-handed just to make it a fair match for his opponent. He still wins. So when Ohio called and Deane answered, it was time to move on and find a new challenge. “He’s more competitive with his own self-discipline,” Becky said. Ohio wasn’t like the other programs Deane had been to before. He didn’t have to resurrect a program from the ground. Ohio had already established a winning tradition that includes nine Mid-American Conference championships, 10 NCAA Tournament appearances and a Sweet Sixteen appearance. Deane earns $139,103 annually to keep that winning tradition going. This time, the challenge wasn’t to build excellence, but rather sustain it. New challenges aren’t bad for him, though. He didn’t mind learning a new style of coaching. “I’m over 20 years in and still trying to learn every day,” Deane said. With that new challenge came great stress. But Deane doesn’t show stress. He’s the kind of person who bottles his emotions up and takes a walk, goes hunting or does stress-relieving activities rather bursting out. The yelling that comes with being a coach doesn’t come with Deane. That’s not his style. There’s no pouting, no mood swings, no down days. He’s consistent. That consistency and character is not only admired by his team and his family, but also his adversaries. Miami head coach Carolyn Condit has been coaching against Deane for more than a decade, dating back to his time at Belmont. Although there is a rivalry between Miami and Ohio, Condit and Deane have mutual respect for each other. Deane made sure to congratulate one of Condit’s players when the Bobcats hosted the RedHawks on Sept. 29 for reaching a career milestone. He didn’t have to do that, but he wanted to congratulate her. After a long day in his office at The Convo, he comes home and unwinds by spending time with his children, Sarah, a high school junior, and Ashlyn, a seventh-grader. Deane’s supportive of Sarah and Ashlyn. They both play volleyball. But volleyball wasn’t forced onto them. If they wanted to play, they could play. If not, that’s OK, because there’s been a wall built between Deane the coach and Deane the dad. He raised his girls to do their best, and if success comes with it, that’s an addition to the hard work. It hasn’t always been easy, but Deane’s been consistent. He and Becky teach them as they go through life. “It’s hard to have kids and teach them winning isn’t everything, but it’s your dad’s job,” Becky said. But as the daughters of a college volleyball coach, they’re expected by their peers to be good at the sport he coaches. There’s pressure there. That’s why Deane and Becky makes sure not to put added pressure on them at home. He understands. Becky said that’s his style. That’s why his two daughters aren’t the only two in the family. He also treats his team like family. He opens his house to them. On various Sundays throughout the year, Deane will have the players over for “Open Sunday,” a time to eat dinner, watch TV, build puzzles, sleep and relax together. It’s a way to connect with his players as people instead of as athletes. Connecting with his players is a priority, which explains why Deane and Becky choose to live in Athens rather than out in the country. Deane would love to live in a house surrounded by trees, but the players wouldn’t be able to walk to his house. Instead, the Webbs compromised. Redshirt junior middle blocker Katie Nelson and Deane have a tight bond — maybe moreso than any other player on the team. Nelson has become a staple in the Webb house, cutting Sarah and Ashlyn’s hair and housesitting when the Webbs go on vacation. Deane trusts her on and off the floor. He’s a motivator while still being relaxed with his players. On Open Sundays, he lays back in his chair, watches football and relaxes. He isn’t different when he leaves the locker room. He’s the same person at home. He’s consistent. That’s his style.